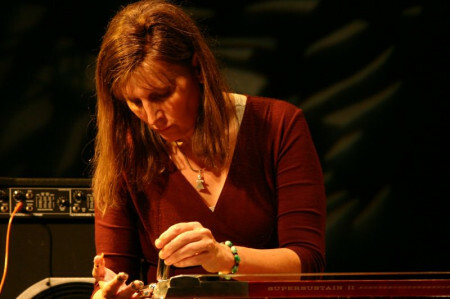 One of the world’s premiere musical innovators on her instrument, Baltimore-based Susan Alcorn has taken the pedal steel guitar far beyond its traditional role in country and western swing music. Known among steel guitarists for her virtuosity and authenticity in a traditional context, Alcorn first paid her dues in Texas country & western bands. Soon she began to expand the vocabulary of her instrument through her study of modern classical music (Messiaen, Varèse Penderecki), the deep listening of Pauline Oliveros, Astor Piazzolla’s nuevo tango, free jazz, and world musics (Indian rags, South American songs, and gamelan orchestra). Her pieces reveal the complexity of her instrument and her musical experience while never straying from a very direct, intense, and personal musical expression. Sharing the evening is Seattle alto saxophonist Wally Shoup. For more than 30 years, Shoup has pegged a claim-stake on the saxophone vanguard, in collaborations with vaunted improvisers from all over, including guitarists Thurston Moore (Sonic Youth) and Nels Cline (Wilco). Lately he’s had a regular Seattle gig at Vito’s with his quartet, including Bob Rees, John Seman, and Mark Ostrowski. This is a somewhat rare opportunity to hear him blowing solo – always a treat!